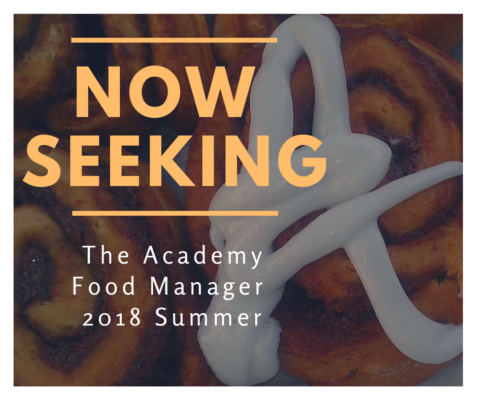 In our ongoing effort to expand the member and volunteer experience, The Academy is seeking to secure a Food Manager for the 2018 season. The Academy Food Manager will be responsible for the day to day operations of the corps’ mobile kitchen truck. Responsibilities include planning, ordering and managing the preparation of meals for the corps’ 200+ members and staff while overseeing a group of assigned volunteers. The Food Manager will work with our administrative team to ensure our performers are receiving the proper nutrition for their rigorous physical activity and schedule. Ability to Prep, Cook and Serve 4 meals a day. Plan meals for 200+ members and staff to ensure the performers are receiving the proper nutrition for their rigorous physical activity. Inventory management on the kitchen truck and pantry including maximizing storage space utilization. Oversee food ordering through The Academy’s SYSCO Foods account, Sam’s Club, Costco, etc., and local food ordering as necessary. Coordinate with the administrative team any daily needs outside of weekly food deliveries. Responsible for the final unloading and cleaning of the kitchen truck when it returns to Tempe after the season. The Food Manager will travel full-time with The Academy from May 25th through August 12th. Alternative coverage durations will be considered on a case-by-case basis. Meals, lodging and travel will be provided for this position. Preferably, the Food Manager would serve in this capacity during all training camps throughout the spring, which comprise of 5 weekend camps approximately once per month until May. The Food Manager will receive compensation commiserate experience. Additionally, all corps-related travel, housing, and meal expenses will be covered by The Academy. However, personal travel and meal expenses are not covered. Knowledge of summer Drum Corps operations not required but desirable. Excellent organizational, communication, and interpersonal skills. Attention to detail, flexible, able to adjust to changes quickly and efficiently.